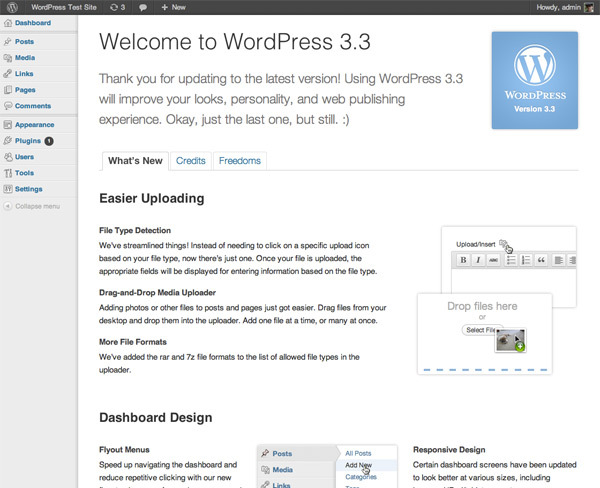 WordPress 3.3 Released With Enhanced Features! As new updates always make things easier and different with passage of time and also play an important role in the survival of such systems. 2ndly it’s also brings a lot of newly born ideas for its lovers. As wordpress had over 65 million downloads since version 3.0 was released, and this version after it so lot of new features are included like new user experience , Easy Navigations , Better Uploading and improved imports section. Let’s discuss them one by one. In this update its very focused on wordpress new users Experience. If one doesn’t have enough user experience on the wordpress dashboard before this is very helpful the improvement mostly based on the installation and configuration like procedure are friendlier then ever before. The interface is now much better, in the dashboard it provides the users various tips to manage different areas! The ugly Admin bar is now replaced with a light one having the more important options there like creating a new post, editing the post, adding link , page or users, moderating comments etc. The admin screen is now more users friendly, gives useful tips in the form of highlights, these highlights help them to change to the new version and gives information about new features and their performance. Even a new screen is waiting there when you update your wordpress it show you a brief summery of the new and improved features. Navigations become easier with this version, now you don’t need to click two and three time to go to a specific section. The left sided Navigations are now smooth and soft , by putting your mouse pointer over at an option gives you flying menu’s that’s don’t waste much of your time and effort. These also makes the website/blog light weighted and page time take less time to load. Uploading is now made easy, simple and fast no more the painful up-loader, like 1st clicking the type of upload (Image , video , others etc.) and then wait to upload. Is now very easy and simple with the drag and drop multiples uploading process or you can also try the browser upload if you feel any problem. That’s really cool step. Before this update only blogger and some other blogging plat forms users can only switch and transfer their data and content to wordpress, before this it was something painful like one was locking a post for a particular author and this was continuing for long. In this version it is more improved, content locks are now released with an easy editing co-experience. 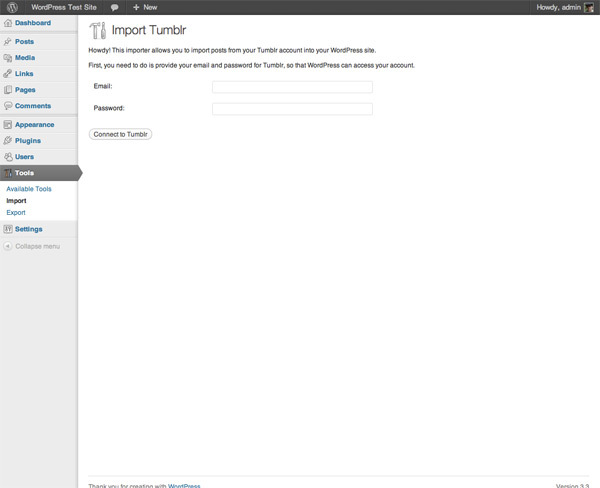 Those who want to switch from Tumblr (hosted one ) to a self hosted wordpress is now made simple providing in import section to install the Tumblr importer to import posts & media from Tumblr using their API. The updation process is easy and simple you can do it with a few clicks. 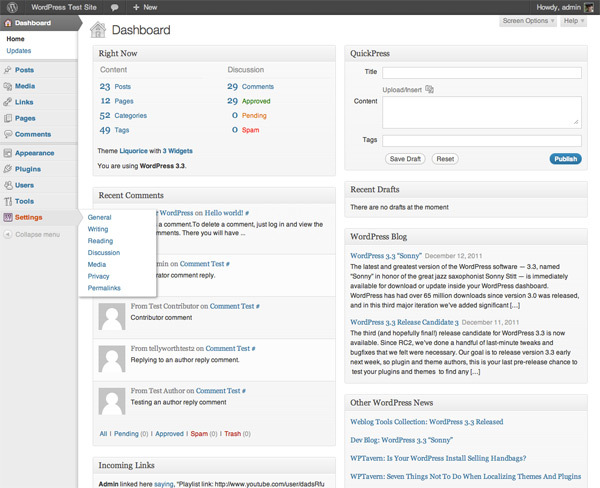 In your dashboard you will see a yellow bar saying “WordPress 3.3 is available! Please update now” click on please update now. Backup your database and files before clicking on update now button. Wait a couple of minutes to complete the updating process. After the installation complete you will see a welcome screen. This was a little about the wordpress latest version hope you enjoy the post, Tell me which new feature of wordpress you like the most. Yes of course , Wordpress 3.3 is awesome with new Features! vkonnect word press plugin is also live. vkonnect plugin works great.